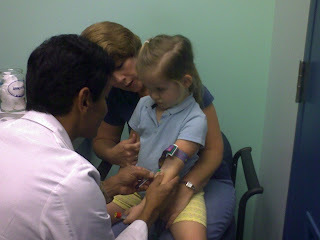 We took Jordan to the doctor for a blood test this morning. In spite of her extreme energy, (almost literally!) bouncing off the walls the entire time we were at the doctor's office, she sat very still for the phlebotomist and didn't even flinch while he was inserting the needle. Nor did she react at all negatively the entire time!! When we were leaving his office, he commented on how brave she was. I think even he was surprised at how well she did.